The Beadful Life @ BeadFX: What's on my bead mat - September edition! The kids are back in school, but the weather seems to be stuck in summer mode. A cooling trend has been predicted, but today was still quite warm. Strangely enough, we all seem to need the cooler weather to get our rears in gear, and start thinking about learning new things. Do you think it’s because we think fondly of school days, and still tend to slack off during the lazy days of summer? Please excuse the sorry state of my bead mat, because I’m using my original, and it’s apparent that it needs a good cleaning! However, I’m excited to say that I learned something new (at least to me), at BeadFX on Sunday. Pearl Knotting! Bet you didn’t think that I would be eager to learn something so traditional, did you? I’ve been wanting to learn this technique for years! It’s a lovely, simple, meditative activity, and it was a joy to take another of Angela Peace’s (the knot master) workshops! I’ve been telling her that I’m “knot dyslexic” (translation – my intuitive right brain, seems to have trouble with repetitive knotting tasks) for a while, but in this case it simply wasn’t true! 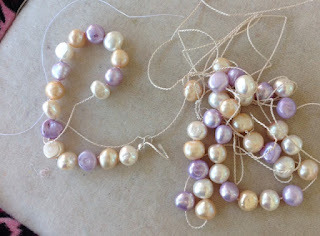 Despite having multiple strings of pearls in my stash, I decided that I needed to buy another for this project. I was tempted by blush and mauve, but finally settled on soft grey pearls, and I’m very happy with my choice! 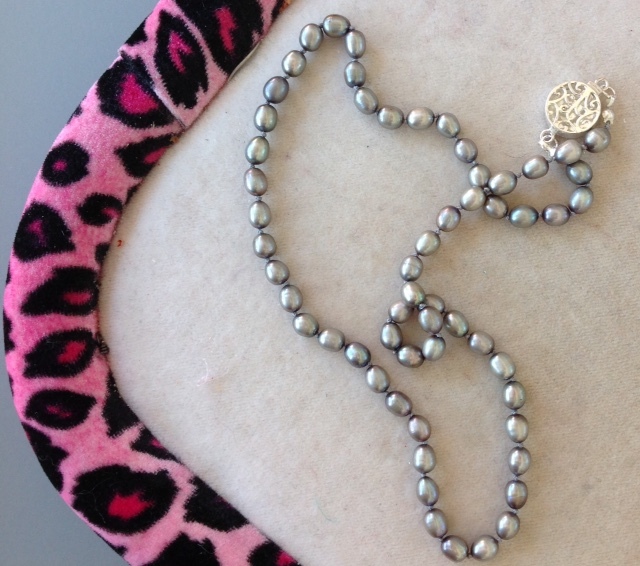 Inexpensive fresh water pearls + a sterling silver box clasp = a very sophisticated look….and it's always about the look!! I finished the necklace in the class, and then started on another, when I returned home. Everything was going along swimmingly, but then I made a fatal knotting error!!!! Oh the horror! I was about a third of the way through the pearls, when my piece slipped off the coffee table. Of course I was mid-knot, and it’s unfortunate that the knot tightened (and I do mean “tightened”) in the wrong place!!! I tried to correct it, but ended up splitting my twisted silk. At that point, I bundled up my pearls, and decided to call it a learning experience. Sigh! Onwards and upwards, and I’ll try again on another day. 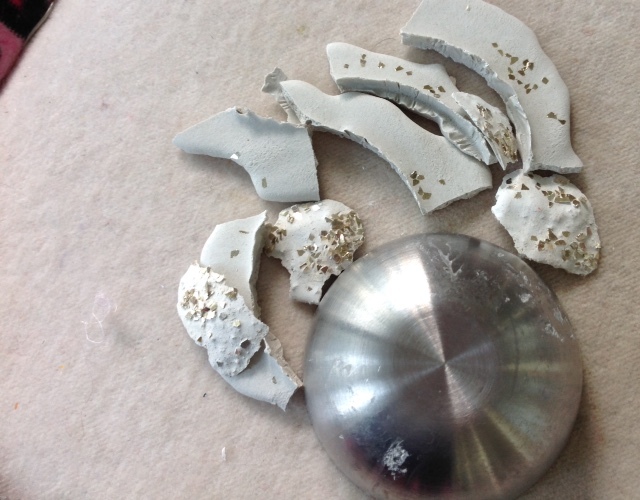 Now on to Create Recklessly, Artist’s Concrete! I’ve used up my first container, and was able to purchase a second, when the last shipment arrived. I’m not sure why, but the other day I decided that I needed to make a small bowl out of the concrete (about an hour before I was due to leave for work). After all, I’m an experienced bowl maker, as I’ve made fabric, felt, and paper ones in the past. Epic fail!!!! I covered a small metal bowl with Saran Wrap, twisted and tied it off, and then turned it upside down, ready for the concrete. I must have screwed up the water to concrete ratio, as the resulting mixture was way too runny, for bowl making success. Not being one too waste product, I decided to see what happened if I used it anyway. I trowelled it on the bowl (with a craft stick), and although it did cling, it also puddled along the bottom. So of course, I let it dry! When I got home, I tried to unmold the bowl. Oh no! Not only was there a concrete lip on the outside of the bowl, there was also one on the inside!!! So the only way I could remove the bowl, was to break the concrete apart with my fingers. Not a terribly taxing task, due to the extremely thin layer that remained on the bowl. I will try again, and I do have a smattering of ideas (heh, heh, of course I do!) ……but what should I do with the broken concrete? I'd hate to just toss it! Broken concrete in a mold, perhaps? Autumn is one of my favourite times of year, and I’m hoping for a huge return to creativity! As the leaves fall, it’s time to refresh our skills, take some classes, and get back to playing with our beads and supplies again. You know that you want to! !